Hotbeam introduces SparkShapes, revolutionary new technology from German lighting technology company Ambright. Ambright “prints” diodes on different materials creating new possibilities in lighting design. This technology offers designers the freedom to visualise, design and integrate light in new ways. SparkShapes allows you to specify functional lighting fixtures according to your vision. You design the shape and light placement. You can use light points downwards for functional light, light points upwards for ambient light and and edge lighting for effect. You can realize your design up to 2400mm x 1200 mm. SparkShapes have a super low profile at only 7 mm. SparkShapes bring lots of light exactly where you need it - with optimum glare control. The power supply can be mounted inconspicuously so that the almost weightless design of the luminaire is retained. The technology guarantees excellent light quality. Design freedom includes the position and intensity of the individual light sources - they can be placed on the top of bottom surface for direct and indirect lighting. Color temperature and CRI can also be specified. Edge lighting allows the form of the luminaire to be highlighted. Furthermore, the light points and edge lighting can be individually controlled allowing for truly intelligent and interactive lighting environments. Uses include custom light luminaire manufacture, lighting for foyers and receptions, floating ceilings, over bench lighting and interactive corridor lighting amongst many and can be used where a very low profile is required. The technology is not limited by application, rather it offers designers unlimited creative freedom. Hotbeam® provides comprehensive and specialised lighting support and expertise, helping architects and lighting engineers specify the correct products for successful projects. Pioneers in the field of LED lighting, Hotbeam has been instrumental in bringing cutting edge products to the Australasian market place. Our portfolio is made up of European and US brands driven by high standards in design, manufacturing and performance. Ambright is a technology leader in the field of illumination. 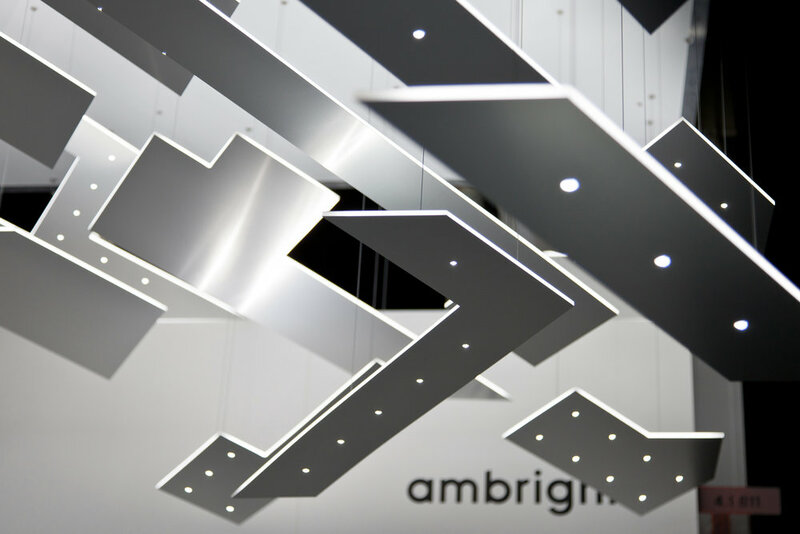 Based in Munich, Germany, Ambright offers individual and standardised lighting solutions. Not only does Ambright provide lighting solutions for OEM customers in a wide range of industries, they have developed their own LED’s create technology resulting in two cutting edge manufacturing processes. These processes SparkLeds and SparkShapes allow lighting designers, product designers and architects to creatively envision lighting. Ambright’s team of engineers, designers, lighting planners and computer scientists all share the fascination for light.